Banking into the wind and then gliding out of sight, a male California condor flew back into the wild after a captive breeding program that helped save North America's largest species of land bird. The 35-year-old bird named AC-4 soared out of his open pen earlier this week at a canyon rim inside the Bitter Creek National Wildlife Refuge, in central California's Kern County. He had been one of just 23 condors left in the world in the 1980s. It was the bird's first free flight since 1985, when a U.S. Fish and Wildlife Service team captured him near the same spot. It was part of a last-ditch attempt to stop the extinction of the California condor, which has a wing span of more than 9 feet. 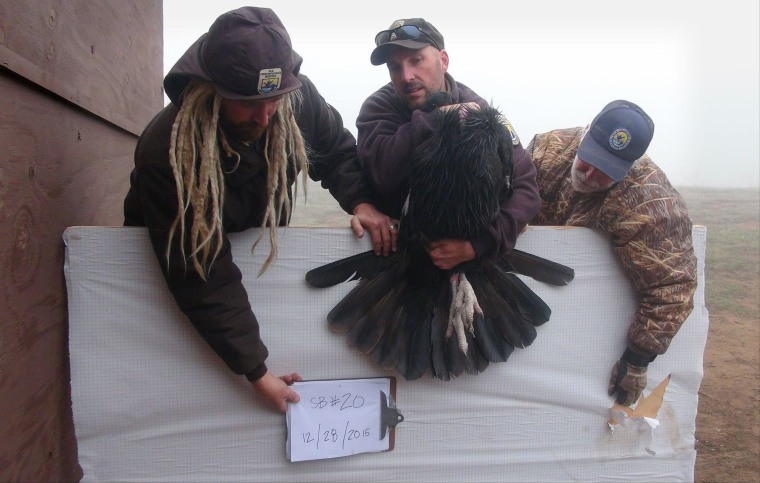 AC-4 needed only a few minutes to get his bearings before flying out of the pen and over the canyon, said Joseph Brandt, a lead condor biologist with the wildlife service. Brandt was sitting on a hilltop nearby to watch the release. "He kind of flew right past us. It was really incredible," Brandt said by telephone Thursday. Lead poisoning is believed one of the main factors that drove California condors toward extinction. The birds ingest fragments of lead bullets when they feed on carcasses of animals shot by hunters. California lawmakers voted in 2013 to phase out lead bullets for hunting by 2019. Biologists believe AC-4 was 5 to 7 years old when they captured him for the captive breeding program. He fathered the first chick born in the program, giving the program's founders greater hope they could save the species. In all, AC-4 sired 30 condor chicks that have been successfully released into the wild. "Many people have poured their heart and soul" into saving the condors, Jesse Grantham, a former condor program coordinator and part of the original team that captured AC-4, said in a statement from the wildlife service. This year, biologists recorded 19 wild condor nests in central and Southern California, more nests than at any point this century, Brandt said. Condors can live up to 60 years in the wild and mate for life, Brandt said. Biologists hope AC-4, which they have tagged for tracking, will pick a mate before the courting season ends this winter, he said.